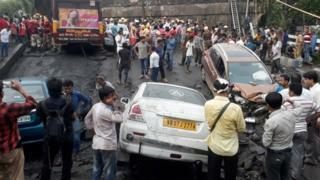 A section of a bridge has collapsed in India's eastern city of Kolkata, and a number of people are feared trapped. One person died and several others were injured, local media reports say. Rescue teams and the army have been deployed to help pull out those who could be under the rubble of the Majerhat bridge. The bridge stood over rail tracks in an old part of the city. It was not immediately clear what had caused the structure to partially collapse. Footage on local TV channels have shown a bus, a few cars and some motorcycles stuck in the caved in section of the bridge. The Chief Minister of West Bengal state, Mamata Banerjee, was quoted as saying by NDTV that the priority now was "relief and rescue". "The rest of the investigation will be done later," the minister added. This is the second such incident in the city in recent years. In March 2016, at least 20 people were killed and many injured when a flyover under construction collapsed. Across India, there have been a number of similar deadly bridge collapses in the past few years.